Our free Invitation maker connects you and your loved ones for every occasion, big and small. The wonderful thing about an invitation is what it means: spending time together. From large events to special one-on-one occasions, our online invitations combine style and ease in an elegant package that you will use again and again. Our invitation maker lets you send save the date cards, RSVP requests and event updates or reminders, so you can easily manage your special day. Create an online invitation that impresses people, and the rest will be easy. The Smilebox invitation maker comes with a huge assortment of templates, from fancy to fun, and you’re sure to find one that fits your style. By adding pictures and customizing the text, you can create a professional-looking online invitation in mere minutes. Online invitations provide a bunch of advantages that traditional cards just can’t match. After sending your first online invitation, you can follow up with others that have slightly different messages, like “RSVP now” and “Just Reminding You”, without all the expense and bother of printed cards. Of course, you may love your customized online invitation so much that you print it anyways, a step made simple by Smilebox. Making an online invitation is easy in just 4 steps. You can upload images from basically any source with the Smilebox invitation maker. Use your own images or those from Creative Commons, for example, to give your online invitation a great visual setting. Want to use a picture from your phone or social media account? No problem – our invitation maker has an option for that as well. Just click “Add More Photos” to upload them. Once you are done, drag and drop the photos you chose to set them on the invitation maker page. Online invitations from Smilebox allow you to change text, fonts, and color schemes, and make your invitation precisely as you want. During this step, you can add the details of your event. If you have already created an online invitation, and saved it on your computer, you can now open it and make changes if necessary. Sum it up and send! Take one final look at your online invitation using the “Preview” feature, and send it off to your guests. Smilebox gives you the option of emailing, posting to social media, printing, and saving it on your computer. Online invitations arrive in your guest’s email within an instant, and their reply can be just as fast. No need to wait weeks to know who is attending your affair. Plus, if you forget to invite someone, online invitation maker will fix that problem with just a few clicks, and send the invitation immediately. Online invitations also let you change details at will. Want to have your party at a different time or place? Just update the details by using Smilebox invitation maker. Ever leave your house for an event, and forget where it is? Or lose your printed invitation, and feel embarrassed about calling the host? With online invitations, this is a thing of the past. Online invitations can be accessed through email or social media no matter where you are (as long as you are connected to the Internet). 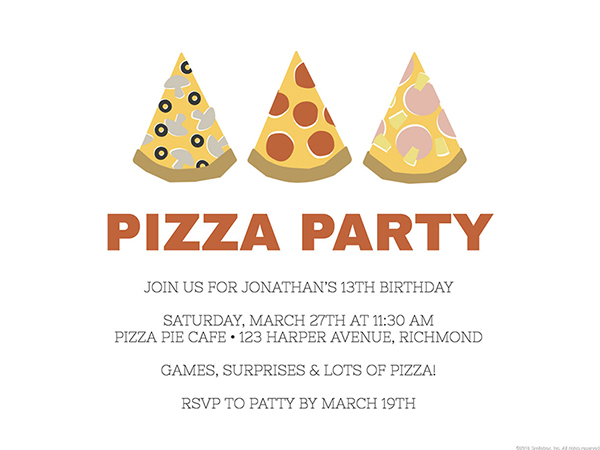 Online invitations also make for clear communication. Few people send printed invitations to remind guests about an upcoming event, but online invitations can be issued frequently to alert guests whenever important information is updated.